Today marks the beginning of Stroke Awareness Month. As a marketing professional, it is a month that I’ve promoted for many years. At Brooks, we share helpful information on stroke prevention, stroke warning signs and stroke recovery. We try to let the community know all we can offer to a stroke survivor – from inpatient rehabilitation, to specialized outpatient programs to a Stroke Wellness Program. We send emails with tips and recipes, post on social media, hold events to bring awareness to the seriousness of stroke. I’m aware of the statistics. Approximately 795,000 strokes occur each year in the United States, one occurring every 40 seconds, and taking a life approximately every four minutes. In the United States, stroke is the fourth leading cause of death, killing over 133,000 people each year, and a leading cause of serious, long-term adult disability. Women are twice as likely to die from stroke than breast cancer annually. Each year is a slight variation from the last in our attempt to get the information out to the public. This year, however, has become much different for me. I’ve met many amazing stroke survivors at Brooks, but over the past few months I had the honor and privilege of getting to know these incredible Faces of Stroke. 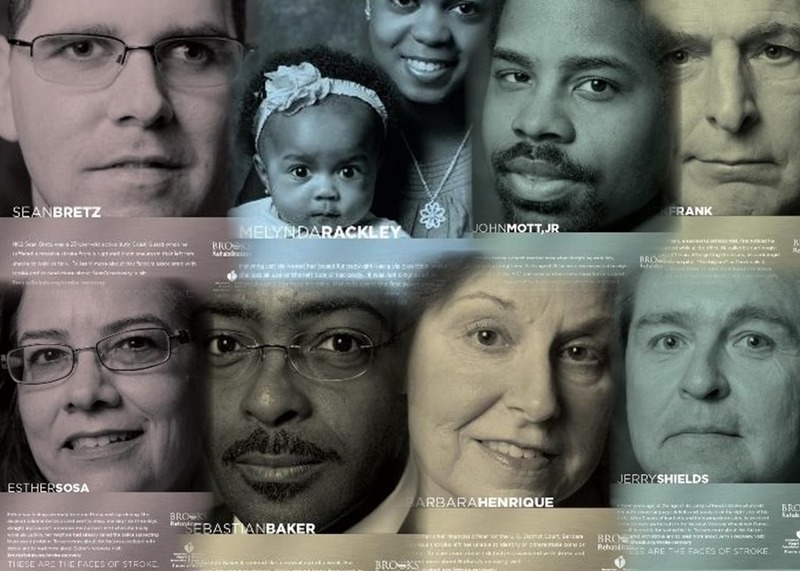 When we decided to create the “Faces of Stroke” campaign along with the American Heart/Stroke Association, I had no idea how much it would impact me personally. I’ve been in marketing for 20 years and I have to admit that this has probably been my favorite campaign so far. While it too seeks to bring awareness to this debilitating and sometimes deadly disease, this campaign focuses on hope. Behind each of our Faces is also a story of love – love from parents, spouses, family and even co-workers. I could feel it as they came in for their photo sessions. I heard it from their friends. I saw it in both the concern and pride on their families’ faces. While they all have something in common – they survived a stroke – each person has their own unique story to tell. Every stroke is different. And a stroke does not discriminate. It can happen to anyone regardless of race, gender or age. They all bravely shared their stories with me, eager to get the warning out to others. This could happen to you! Know the signs! Take control of any risk factors that you can change before it’s too late. I encourage you to read each of their stories on our website and get to know the person behind the statistics. I hope that they will inspire you and touch your life as they’ve touched mine. Luckily for these eight Faces, their stories will continue for many more Stroke Awareness Months to come. This entry was posted in From My Perspective, Life After a Stroke and tagged faces of stroke, healthy living, stroke recovery, stroke rehabilitation, stroke testimonials. Bookmark the permalink. When is the Right Time to Look for a Job Post-Stroke?